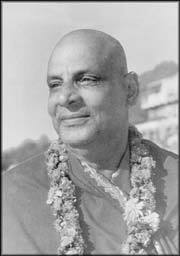 Swami Sivananda, one of the greatest Yoga masters of the 20th century, is the inspiration behind the Sivananda Yoga Vedanta Centers. Filled with a tremendous desire for spiritual growth and enlightenment Kuppuswami went to North India in search of his Guru. After spending time in Varanasi (Banaras) he travelled north to the Himalayas. There in the holy town of Rishikesh (which means “the abode of the sages”) Kuppuswami discovered his Guru who gave him Sannyas (a monk’s vows of renunciation). After taking these vows, Swami Sivananda Saraswati, as he would be known henceforth, started an extremely intense daily Sadhana (spiritual practices) and Tapas (austerities) for the next 10 years or so. By the end of that period many co-Sadhus felt drawn to Swami Sivananda for his instruction and his spiritual inspiration. “Serve, Love, Give, Purify, Meditate, Realize”. In 1957, Swami Sivananda sent his devoted and industrious disciple, Swami Vishnu-devananda to the West where he then established the International Sivananda Yoga Vedanta Centers.